01 Aug The fluidity of a brand and helping it thrive. 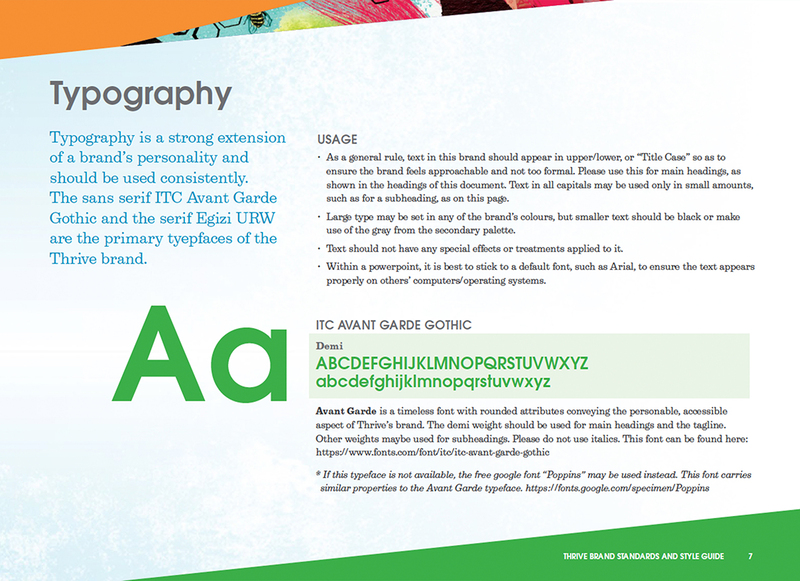 After creating a new brand, we often come up with brand guidelines to help our clients apply it consistently and correctly. Recently, Thrive came to us with an additional challenge by asking us to take a look at both past and present brand elements (think typefaces, colours, illustrations, etc.) and establish formal guidelines to work from. Thrive’s story is one of a grassroots organization that grew to be a staunch supporter and advocate for local economic development, community initiatives, and social enterprises. As is often the case with brands, changes and growth within the organization it represents asks that one take a fresh look at how well the brand is serving it. 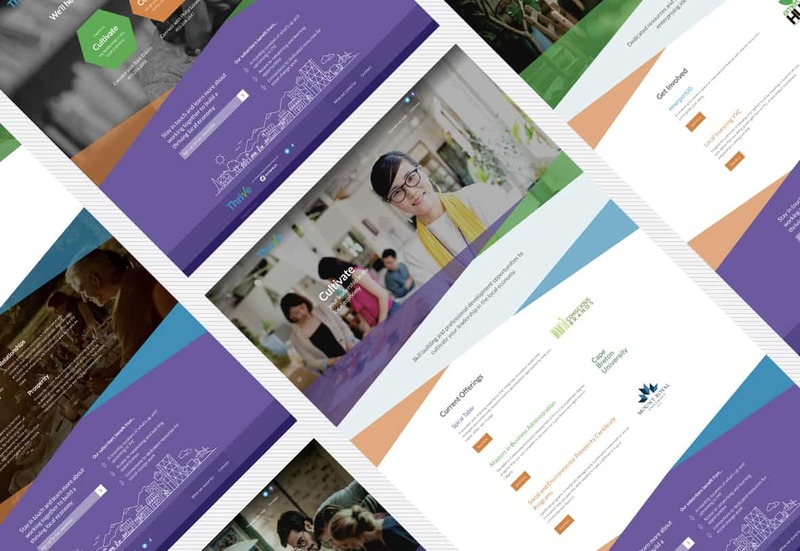 And while we were familiar with the core of Thrive’s brand by way of working on their website, we did not create the logo or many of the elements being used in the brand. 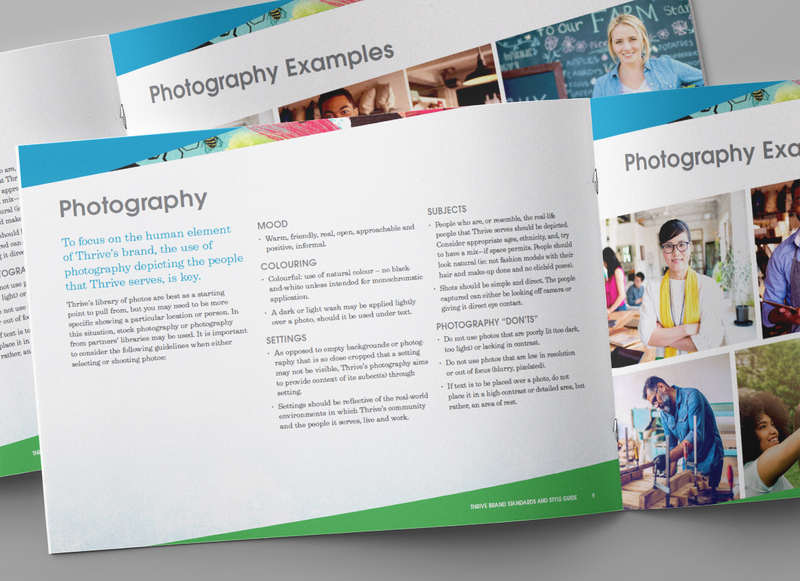 So, the first part of this project involved checking in with Thrive to review present strategic goals, the organization’s mission, and values, then evaluate whether the branded elements being used aligned with them. The second part of what we needed to do was to make sure that—of the elements that were a fit— everything worked well together visually. 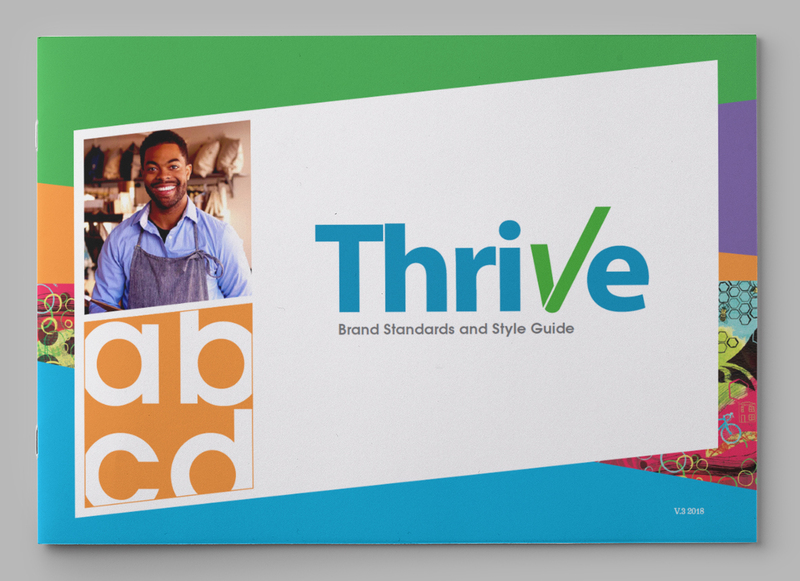 In fact, as we performed an initial audit, we found that over the years, Thrive’s brand was visually interpreted in a few ways. 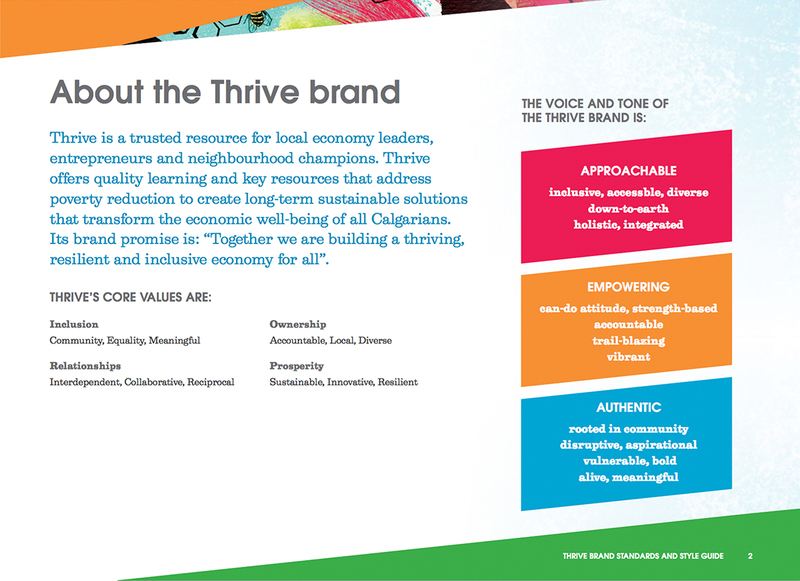 But, either the branded elements were not working well with each other, they didn’t represent the essence of Thrive in its present state, or, they were not being used consistently by staff at Thrive. Working collaboratively with Thrive, we came to some decisions about what should stay, what should go, and what we could add to tie it all together. For example, Thrive had this lovely illustration that didn’t seem to blend with a later iteration of the brand’s colour palette. 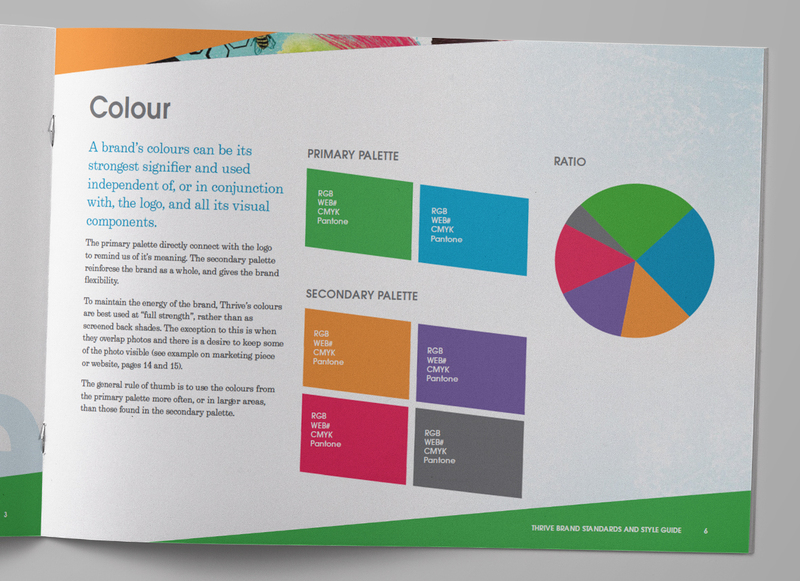 So we built out the palette, determining primary colours and adding the red from the illustration into the secondary palette. 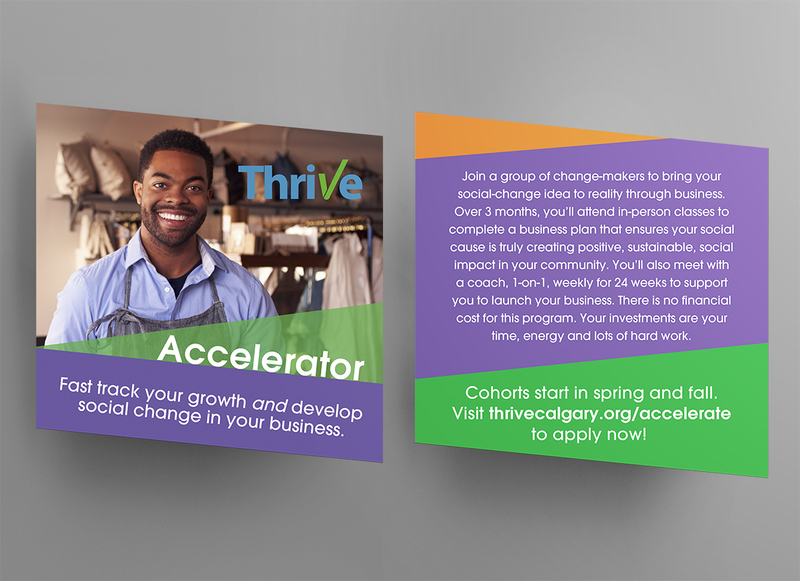 Through the provision of education, connections and resources, Thrive empowers Calgary’s change-making community. The dynamism behind these things—positive change, connections, empowerment is conveyed through this illustration, these colours, angular shapes, photography, and approachable typefaces.